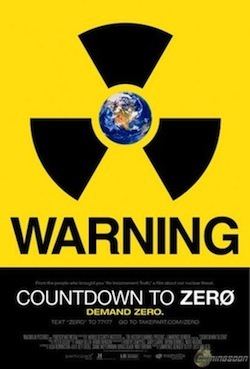 The History Channel  will be showing Countdown to Zero, a riveting documentary about the global threat of nuclear weapons and the imperative of seeking a world without them. A film by the academy-award winning producers of An Inconvenient Truth, Countdown is a compelling and eye-opening film. It explains in clear terms the nuclear threat we face and the global imperative of seeking the elimination of nuclear weapons. It features interviews with Jimmy Carter, Mikhail Gorbachev, Pervez Musharraf, Tony Blair, and Ploughshares Fund’s own Joe Cirincione. The film makes a frightening observation. In the 21st century, an odd twist of fate has left us in a world where the threat of nuclear war has receded, but where the likelihood of a nuclear attack - by accident, miscalculation, or madness - has increased. Thousands of nuclear missiles remain on hair-trigger alert around the globe and terrorists are seeking the means for nuclear destruction. Given the complexity and unimagineable risks of this status quo, the film makes the case that going to zero is the best path to security. Catch the trailer below. In April 2009, President Obama made it the official policy of the United States to “seek the peace and security of a world without nuclear weapons.” Beginning with the Nuclear Posture Review and the Nuclear Security Summit, the United States led the way towards reducing the role the nuclear weapons play in national defense and securing loose and vulnerable nuclear materials around the world. The New START Treaty, signed between the United States and Russia, began the process of much needed bilateral arsenal reductions, and talks are ongoing for the next arms control treaty. As Countdown to Zero illustrates, we cannot afford to lose this momentum and must continue to reduce global nuclear arsenals and lock down vulnerable nuclear materials to keep them out of the hands of terrorists. The film provides a powerful message about our security and delivers a rallying cry for the necessary global elimination of nuclear weapons. So pick up some popcorn on the way home and tune in to The History Channel at 9:00 pm. You can also stream the film through Netflix. Either way, you need to see this film.